Editors Note: A photo for this release will be available on the Canadian Press picture wire via Marketwired. BlackBerry Limited (NASDAQ:BBRY)(TSX:BB), a global leader in mobile communications, today introduced a white color BlackBerry® Passport and a limited edition red color BlackBerry Passport. Just in time for the holidays, customers in North America will be able to purchase red and white BlackBerry Passports on ShopBlackBerry.com and Amazon.com. Featuring a large square touch screen and new touch-enabled keyboard, the BlackBerry Passport is a device purpose-built for productivity-driven business professionals who want a smartphone that empowers them with the mobile tools they need to get things done. And now, BlackBerry Passport is available in three color options, allowing customers to choose the color that best fits their style - from traditional black, to classy white and powerful red. "We are thrilled with the positive reception the BlackBerry Passport has received since we launched in September," said BlackBerry Executive Chairman and CEO, John Chen. "The introduction of the red and the white BlackBerry Passport colors underscores our commitment to break through the sea of rectangular-screen, all-touch devices, offering different styles that meet mobile professionals' personalities." Inspired by an actual passport, the universal symbol of mobility, the size and form factor of BlackBerry Passport is portable enough to easily tuck into pockets and use wherever you go. Utilizing premium, robust materials such as Corning® Gorilla® Glass 3 for the display and forged stainless steel for added strength, BlackBerry Passport will provide the durability business professionals require in a smartphone. The large square screen is optimized for viewing and creating content, and makes everyday tasks like reading and writing emails, reviewing and editing documents, web browsing, and map navigation more comfortable and effortless. The BlackBerry Passport includes the industry's first touch-enabled keyboard with gestures that make typing, editing and navigating more efficient and accurate. BlackBerry's physical QWERTY keyboards have always made it easier for users to create polished, professional communications with exceptional accuracy. 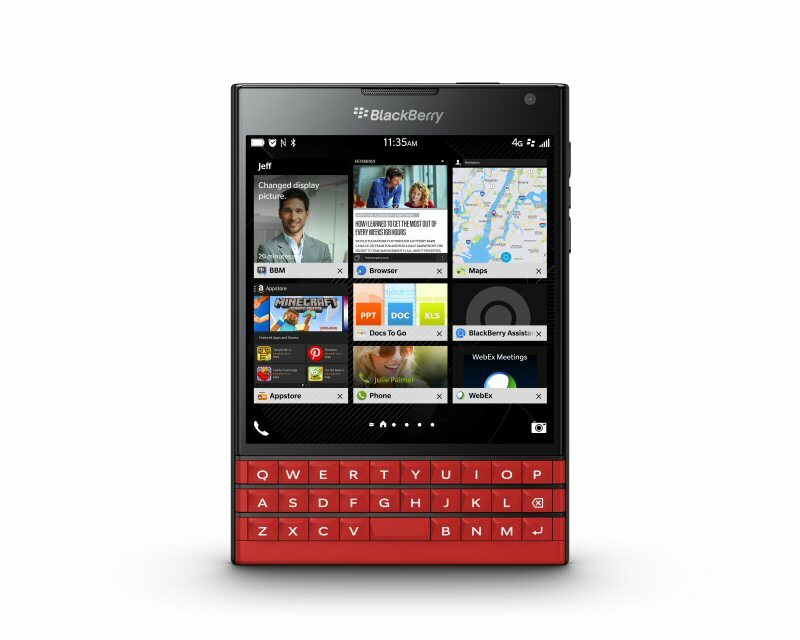 The BlackBerry Passport is one of the first devices to launch on BlackBerry's latest OS platform, BlackBerry 10.3. It comes preloaded with new productivity-enhancing features including BlackBerry Blend and BlackBerry Assistant, as well as the BlackBerry World storefront and Amazon Appstore, offering access to the very best apps for work and play. The BlackBerry Passport is now available in black through global carriers and online through ShopBlackBerry.com and Amazon.com. Red and white variants are available online for pre-order today and will be on sale on November 28 through ShopBlackBerry.com in North America. The red BlackBerry Passport is available online for pre-order today through Amazon.com in the United States and the white BlackBerry Passport will be available for pre-order soon. Additional market availability will be announced in the coming weeks. For more information about BlackBerry Passport, please visit www.BlackBerry.com/Passport. To learn more about BlackBerry Blend, please visit www.BlackBerry.com/Blend. To view the photo associated with this press release, please visit the following link: www.marketwire.com/library/20141124-bbpassportred800.jpg.